The next graph shows the employment growth performance. I could offer more evidence (and have previously), but this is enough. And, remember, that it is only because the ECB consistently breaks the law (by funding fiscal deficits) that the Eurozone is still intact. My 2015 book – Eurozone Dystopia: Groupthink and Denial on a Grand Scale – was named to reflect the reality of the European Union. (b) He lives in a parallel universe. (c) He was trying to inject humour into the disaster of the euro. 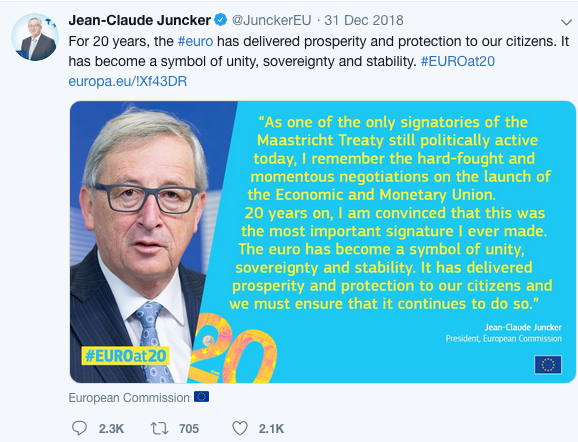 The single currency has been one of the biggest European success stories: there can be no doubt about its importance and impact over the first two decades of its history … The euro and the close economic cooperation that it entails has evolved over time, overcoming challenges in its way. 4 Ingelesez: “These sort of statements attempt to revise history and cover up the damage to ordinary citizens of one of the biggest scams in European history. The G7 is the US, UK, Japan, Canada, Germany, Italy, France. Australia, Austria, Belgium, Canada, Cyprus, Czech Republic, Denmark, Estonia, Finland, France, Germany, Greece, Hong Kong SAR, Iceland, Ireland, Israel, Italy, Japan, Korea, Latvia, Lithuania, Luxembourg, Macao SAR, Malta, Netherlands, New Zealand, Norway, Portugal, Puerto Rico, San Marino, Singapore, Slovak Republic, Slovenia, Spain, Sweden, Switzerland, Taiwan Province of China, United Kingdom, and United States. 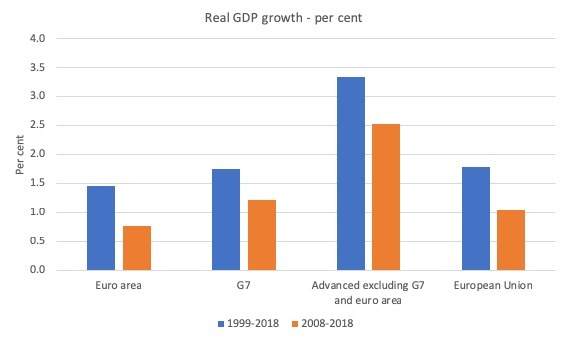 The next graph shows real GDP growth for these aggregates (and the European Union) between 1999-2018 and 2008-2018. 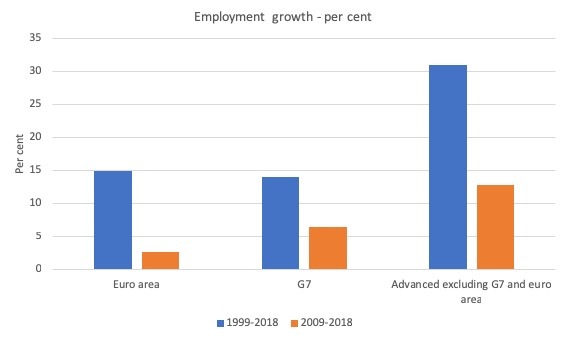 Knowing the composition of the aggregates allows one to do some deduction and conclude that the Eurozone Member States have peformed poorly since inception and particularly so since 2008, when the first real test of the monetary unoin came. There was an extraordinary article in Bloomberg a couple of weeks ago (December 22, 2018) – Cornwall Pub-Hand Shortage Shows the Future of Work After Brexit – which was trying to spin a line that the Brexit decision was creating labour problems for employers in the tourist areas of Cornwall. Cornwall, the southwest peninsula of Britain, is struggling to find enough bartenders to serve the millions who flock to the rocky coastline every year. Any prospect of recruiting cheap labor from the continent has dried up after the region voted along with the rest of the country to leave the European Union. More significantly, pubs and hotels are coping with an ageing, dwindling workforce that often doesn’t have the right skills. This gets to the heart of the productivity problem in the U.K., which is dogged with some of weakest growth in output per hour worked among Group-of-Seven nations. All negative by the sound of it. A typical Remain-type hype that Britain will cease to exist because it will not be able to harness any labour skills. Not a mention of the word ‘austerity’ and the its impact on the sustained period of poor economic growth and the flow-on effects to productivity-enhancing investment and training. No, apparently productivity growth in Britain is lagging behind because the decision to exit the European Union has deprived industry of “cheap labor from the continent”. You just can’t make this sort of stuff up. Whether the decision by the British people to exit the European Union is actually behind the ‘shortage’ of labour in Cornwall is one thing. And that proposition is not sustained by the article with anything but anecdotal evidence. But the article does ‘spill the beans’, even if that is not its intention. … a broader view of the industry as an investment, a way to retain them at the end of their training. The organisation of workplaces is evolving (“moved to a three-month ahead rota in its kitchens — something that raises eyebrows among small business owners used to operating on a week-to-week basis”) and workers will be able to take advantage of the fact that vacancies “hit a record high in the three months through October as unemployment held at the lowest since the 1970s” to get better pay and conditions and redistribute some of the profits back to those who do the work. If the access to cheap imported labour is being reduced then for low-wage workers in Britain that will be a good thing. And in Cornwall “a 56.5 percent majority voted Leave”.